With Valentine’s Day right around the corner, I’m starting to test out my dessert ideas in the kitchen. I personally always like to do a test run of any baked good that I am doing for a special occasion. I do this just to ensure that the recipe tastes good and is perfect for my liking. Brownies always go over well with my fiancé, so I decided to do a trail run of cheesecake brownies for our special day. 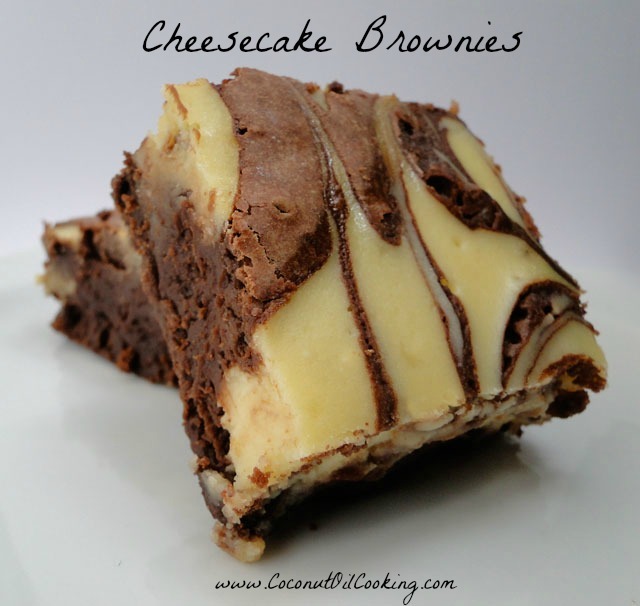 You can never go wrong with serving cheesecake brownies since you have the best of both desserts packed into one bite – yum! Make brownie mix according to package directions, making sure to replace coconut oil for vegetable oil. Pre-heat oven to directions on brownie mix box and set bowl aside. Spray a brownie pan with Kelapo Coconut Oil Cooking Spray. Next, spread the brownie batter into the greased pan. Empty cream cheese, egg, and sugar into a large bowl. Mix well with an electric mixer until all ingredients are smooth. Dollop the cream cheese mixture over the brownie batter and smooth out with a spatula or knife, being sure swirl the mixture. Bake the brownies according to the box directions. To check if brownies are finished, place a toothpick in the center. This will come out clean if fully cooked. Remove brownies from oven and place on the counter to cool before cutting. You can get creative and cut the brownies out with a heart shaped cookie cutter – how cute! I’m thinking I will do this for my final creation on Valentine’s Day. For more Valentine’s Day inspired recipes, be sure to check out our Red Velvet Cake Poppers and Raspberry Chocolate Hearts. Have you used coconut oil in your baked goods?